Stephanie D. Morris is a photographer who was born and raised in Pittsburgh, PA, and received a B.S. in Microbiology from Pennsylvania State University. She developed a love for photography because she enjoyed looking at old pictures of her family as a means to piece together her history for her own edification. She became the family documentarian as a teenager and has been taking pictures ever since. She considers herself to be an emerging artist who is continuously seeking avenues for artistic expression. She is keenly interested in the story telling aspect of photography because as a scientist, she is curious by nature and she enjoys the proposition of discovery. This informs her creative side and influences how she approaches the art. Stephanie has done documentary photography for several Minneapolis based groups including the Minneapolis Youth Coordinating Board, Penumbra Theatre, the Wilma Gary Quilt Dissertation, and the Celebration of LIfe Mural Project in the mid to late 90’s. She claimed herself as an artist and began to exhibit her work in the Minneapolis-St. Paul area in 2010 after encouragement from art mentors, family and friends. Her work has been on display at several venues in the Twin Cities in the past few years. 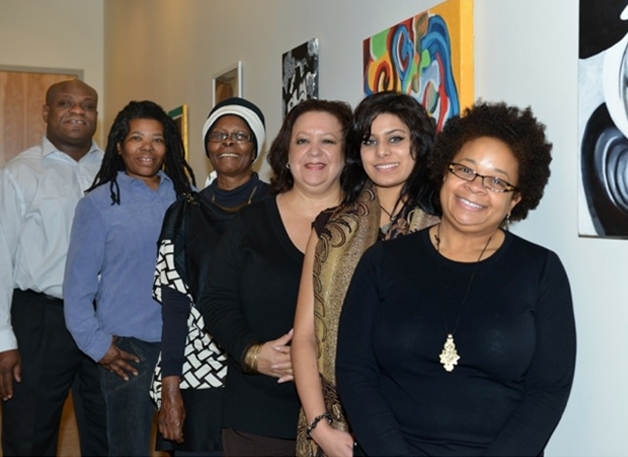 They include “Big Blaq – The End of Acquiescence,” UROC Gallery Show – “The Stories Within Us,” “Ya Feel Me” at Obsidian Arts, the Black History Month exhibit at Hennepin Gallery in the Hennepin County Government Center in 2011 & 2012, and “Fight Like a Mother” at the ColorWheel Gallery. In 2012, Stephanie participated in “Fade2Blaq” where she previewed a body of work called “Lao tong – an exploration of the love between women” and “Black I’s” at Obsidian Arts. She has also had four solo shows in 2012: Caribou Coffee in St. Louis Park, Caribou Coffee in Edina, Cafe Southside in Minneapolis, and the American Red Cross in St. Cloud, MN. Her first show of 2013 was at the Basilica of St. Mary’s “The Culture of Balance, Rhythm, and Texture” in celebration of Black History Month. I have been a passionate lover of photography for many years and I continue to be amazed by the world that I am blessed to see. I am most intrigued by that which is not obvious at first glance. It is likely the scientist in me that compels me to examine things around me. Photography allows me to satisfy my natural curiosity. I choose the subjects of my photographs based on how they elicit emotion from me. I believe that everyone and everything has a story to tell about the existence of life over the course of time. The subject can be a person or an inanimate object, and the span of time can be a few moments or many years. I have a keen interest in getting at some part of the story that I see through the lens of my camera. Once witnessed, history unfolds and invokes a sense of intimacy between me and the object of my curiosity. In that moment, I move beyond my microcosm into another realm of existence that may otherwise have been missed. My goal is to create images that reverently extend my world view in a way that speaks to those who experience them. My hope is that my work will be a provocative commentary on life.